Originally a paper written for an English 8B class, submitted Oct. 5, 1956, titled "A History of My Neighborhood"
I live in the Haight Ashbury District. My family moved here after my father came back from Okinawa. It has been my home for nine years. I hardly remember Oakland. The Haight Ashbury District is my home. The history of the Haight Ashbury begins a long time ago. It appeared over a million years ago when the ocean floor buckled to form our present coastal range. For most of its existence, the area was wasteland. Sand dunes stretched from the ocean to the foot of Buena Vista Park and choked most life forms. Groves of California "live oak" and patches of dune grass grew near springs or against rocks, but the area was like a desert. Costanoan Indians did not like it here and lived in the areas to the east and south where they could fish and forage for berries, roots and nuts. The Spanish did not live here either. When they divided the San Francisco Peninsula into land grants they did not even think about the area. The 1849 Gold Rush brought Americans to the town they named "San Francisco" but the "forty niners" didn't live here either. They did not like the sand and fog and probably did not like the fleas. "The wind was cold and benumbing, and blew with such force that we could hardly make headway against it. The fog was so thick that we could scarcely see 50 yards behind or before. I have no opinion of the six mile ride in the clouds; but if I ever have to take another, I want to leave the horse in the stable and go in a balloon." 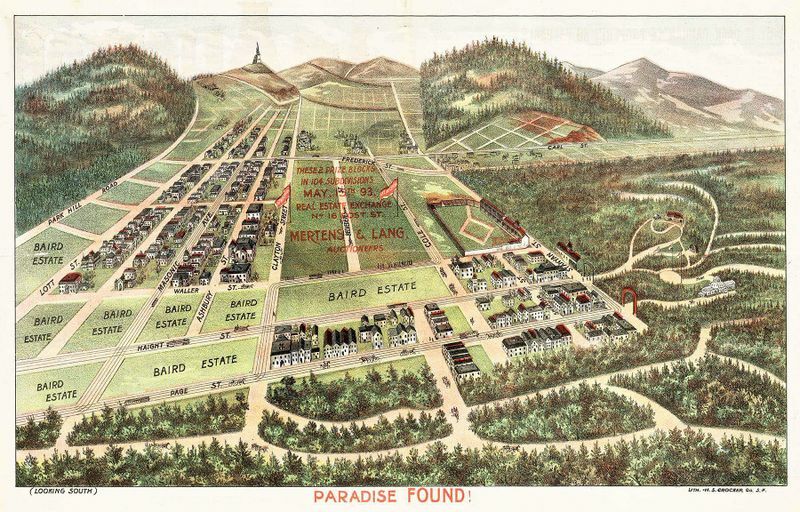 Early maps of San Francisco show the Haight Ashbury District as "uninhabitable." It was not until the boom town of clapboard and canvas had been transformed into a seaport of brick and stone that San Franciscans cast more desirous eyes upon "the outlands." With a bulging population the farms and pastures of the Fillmore District were subdivided and sold to home builders. Concurrently "ranches" sprang up in the greener valleys of the Haight Ashbury District. Ranchers fenced off five to ten acre plots and raised the cattle, sheep, pigs and chickens to feed the city. Unclaimed lands attracted squatters where tax free shanties dotted the sand dunes. As San Francisco grew, it matured. Its residents soon craved the amenities enjoyed by Eastern urbanites. Accordingly it was decided that San Francisco should have a public garden to rival New York's new and celebrated Central Park. Work began in 1868 under the direction of the mayor's "Committee on Outside Lands." Twenty years later the engineers and gardeners had so successfully conquered the windswept desert that San Franciscans flocked to their green retreat each weekend. 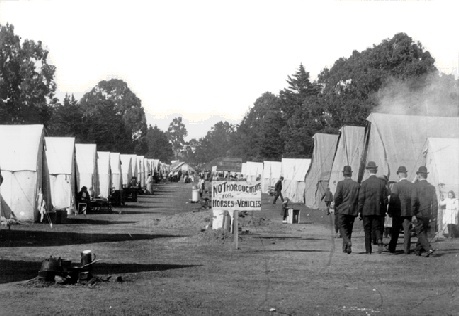 The advent of Golden Gate Park was to have a huge impact on the area. For most people access to the park was by cable cars on Haight, Oak, Hayes and McAllister Streets. Most of the lines terminated at or near the main pedestrian entrance to the park at Haight and Stanyan. With the influx of visitors a local commerce quickly developed. Poolhalls, taverns, restaurants, livery stables, hotels, boarding houses, bicycle shops sprang up near the intersection. An amusement park boasting caged lions, a waterslide, vaudeville and a miniature railroad opened at Haight and Clayton Streets. If one tired of the man-made amusements there were always the natural attractions--the commanding view from Mt. Olympus, the oak grove on Buena Vista, or the swimming hole at Fell Street. In short, by 1890 the Haight had become the recreation hub of the city. The residential development of the Haight was closely tied to the popularity of Golden Gate Park. In the 1890's home builders soon realized that the cable cars which drew weekend excursioners out of the city could also carry working people to jobs downtown. The Haight Ashbury became an attractive suburbia for those buyers who were avoiding the cramped, expensive land tracts to the east. But for home builders the neighborhood was more than expedient; it was fashionable. The neighborhood had absorbed "the horse and buggy set" which was lured to the area by its proximity to the Park and its luxuriant carriage entrance, the Panhandle. Here the upper and middle classes built a society which rivaled Nob Hill. The city fathers who had made it big bought grand homes on "politicians row" now known as Ashbury Street. On Page Street lived the immensely rich Floods of mining fame and the I. Magnin's. A second wave of building followed the 1906 disaster. The earthquake and fire had left the neighborhood untouched, and this too was another boom to development. 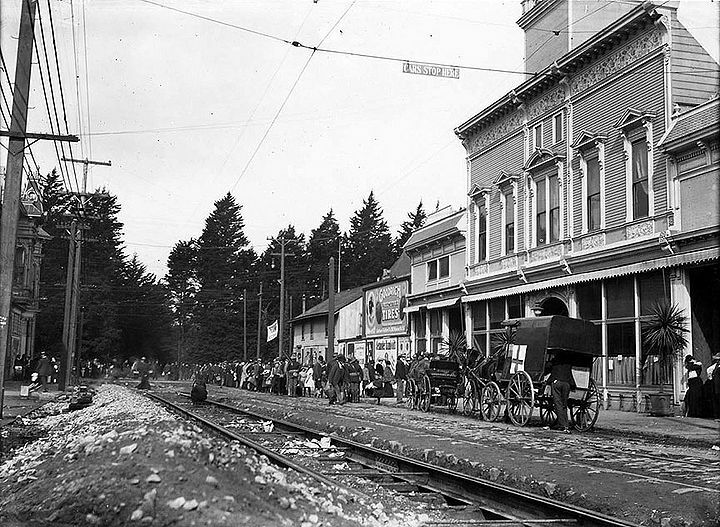 Many families routed from their homes found temporary housing in the hotels along Stanyan Street. Less fortunate families were sheltered in the tent villages in the park. Many decided to make the Haight Ashbury their permanent home. Their migration west changed the character of the district. The new homes were frequently tract houses or flats built by development associations and sold to the middle classes. With its swelling population, the community began to gradually grow up the slopes of Ashbury and Parnassus Heights and out over the sand dunes towards the ocean. 1906 refugees at Page and Stanyan. By the 1910's, the transition was complete. The new Haight Ashbury was a healthy, comfortable neighborhood. 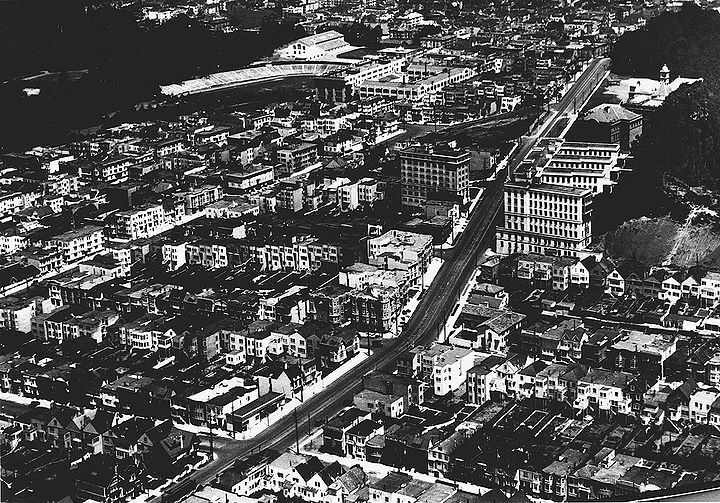 It remained the gateway to the park, but the Stanyan Street commercial area had expanded along Haight and that street became the prime business area for most of western San Francisco. 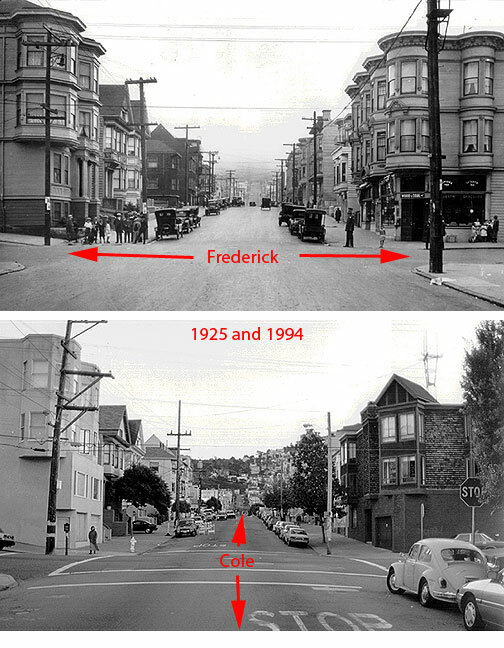 A measure of the vitality of the district at that time was a decision in 1912 to increase the number of street cars along Haight Street from 30 to 41 cars per hour. There were three elementary schools (Grattan, Dudley Stone and Crocker), Polytechnical and Lowell (then at Masonic and Hayes) High Schools, the University of San Francisco, four hospitals (UC Medical Center, St. Mary's, Trinity (at Page and Masonic) and Harkness (at Oak and Baker)). In 1924 a San Francisco columnist wrote "There is a comfortable maturity about the compact little city that San Francisco knows as Haight Ashbury. Not the maturity that is suspicious, but a nice upholstered and fuschia garden sort of grown-up-ness, just weathered enough to be nice, and new enough to be looking ahead to the future." During the Depression families were forced to "double-up" -- two or three families lived in a house, flat or apartment built for one family. Then came the war and many servicemen and war workers came to San Francisco. Both developments brought changes for the neighborhood. Building codes were relaxed to permit additional subdivisions. The changes were not all architectural. The neighborhood was increasingly working class. The upper and middle classes were leaving for neighborhoods in the developing Sunset or "up the hill." The new owners were absentee landlords who rented to the working classes and to Negroes. I like to live in the Haight Ashbury District because it is home. It is still a nice place to live. My mother and father talk about selling our house so that we can live near to my uncle in Burlingame. My sister and I do not want to leave because we like it here. If we move it will be a great mistake. You shouldn't run away from problems. Sometimes when I look out my window at night I can hear the lions' roar from their cages at the Chutes. Originally a school paper in 1956, this was published by the Haight Ashbury Arts Workshop in 1980 as part of their Street Museum installations. View of Parnassus Heights with UC Medical Center at right, Kezar Stadium at upper left (home to San Francisco 49ers starting in the late 1940s), as seen from above apx. 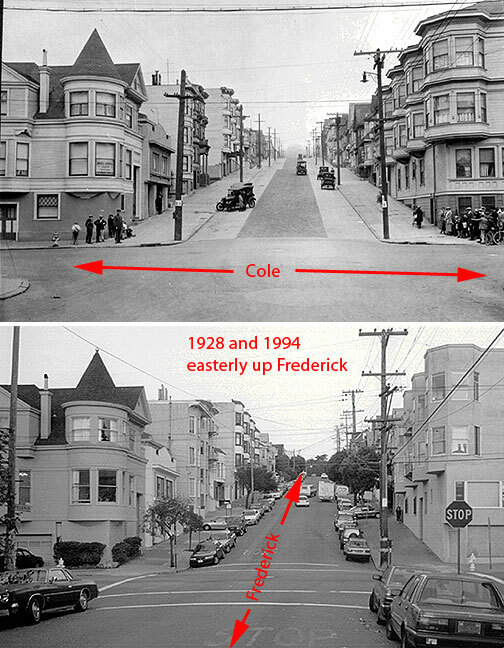 6th and Judah looking north-northeast, September 6, 1927. 19th century real estate map promoting the lands of today's Haight-Ashbury and Cole Valley.